The fourth oldest and one of the most elite clubs in Houston, BraeBurn Country Club dates back to the 1920s when John Bredemus was hired to build what was supposed to be called the Colonial Country Club. The Bridges Course is the most recent addition, featuring wider fairways than the other nines and offering some interesting risk-reward decisions. The 427-yard No. 3 stands out because of its three-tiered fairways. The Bunkers Course is named appropriately, featuring loads of sand in the design. They say No. 1 is the toughest opener in Texas, playing 417 yards with two extremely dangerous shots. The tee shot must be perfectly placed and the approach must carry 200 yards over water. The Clear Creek Golf Course is a flat, wide-open links-style track loaded with water and bunkers. The only sort of elevation changes you'll experience come from the ravines that route through the course and the undulating greens. The golf is the centerpiece of a small, upscale housing community, Northgate is crammed into an area of land that's dominated by huge trees. Labeled a shot-maker's course because of the super-tight fairways and small, testy greens, the course offers 27 holes of golf that many consider some of the toughest in Houston. Founded by golf legends Jimmy Demaret and Jack Burke in 1957, Champions is the site of the 1967 Ryder Cup, as well as the 1969 US Open (won by Orville Moody) and the 1993 US Amateur. The club offers two impeccable 18-hole courses that feature narrow, tree-lined fairways and large, quick greens. The 9-hole First Tee Junior at FM Law Park in Houston, TX is a public golf course that opened in 2000. First Tee Junior at FM Law Park measures 2473 yards from the longest tees. The course features 4 sets of tees for different skill levels. The 18-hole Gold/White at Pine Forest Country Club in Houston, TX is a private golf course that opened in 1985. Designed by Jay Riviere, Gold/White at Pine Forest Country Club measures 6903 yards from the longest tees. The course features 5 sets of tees for different skill levels. Texas' oldest existing 18-hole track was originally built in 1908 to serve members of Houston Country Club. When the club found a new location in the 1950s, Gus Wortham bought the facility and opened it to the public with $60 annual dues. Another of Houston's old-school golf courses, Hermann was built by John Bredemus and became the playground of Tommy Bolt, Jack Burke, Jr., and Jimmy Demaret, among others. After shutting down in 1997 for extensive renovations, the facility has become one of the finest municipals in the Harris County area. Heron Lakes makes for a fine weekend when you're looking to combine hacker-friendly golf with post-round horse race wagering. Located across the highway from the Sam Houston Racepark, Heron Lakes serves up 18 holes of relatively easy golf where length isn't required to score well. The Highlands Course is probably the more stimulating of the two tracks at Wildcat GC, offering better views of the city, natural wetlands and grasses, and some intriguing flat sand bunkers. The Jackrabbit Course is the most difficult, featuring tight fairways, frequent out-of-bounds, and numerous water hazards. Nos. 4 and 8 are both over 200 yards and feature water. The Horsepen Course is flat and wide open, spotted by a few ravines located by the greens. Around the turn of the century Houston had no golf to speak of, unlike today where over 130 courses can be found in the Greater Houston area. It all began to change when members started to contribute $25 each- eventually, the money was used to lease 45 acres from Rice University. Houston National Golf Club, located in the northwestern part of the city, definitely follows the old adage that "everything is bigger in Texas." This whopping course stretches to 7,337 yards from the back tees. It is a lengthy golf course no doubt, but it doesn't just favor those who can hit long. The layout has a unique links design, so long hitters will be pleased but they will have to be careful of the numerous pot bunkers and other strategically placed hazards. The Jack Rabbit Course at Champions GC, often overshadowed by the Cypress course, actually has a higher slope rating for its George Fazio design that features small greens and numerous out-of-bounds. The Wolf Corner Course is the shortest of the three nines, and is more wide open. Its famous par 3 is No. 6, which plays only 106 yards but features a green surrounded by water on three sides. Architect Roy Case created both courses on this new 36-hole, daily-fee facility that is located only 10 minutes from downtown Houston. In addition to the views of the skyline, Case had at his disposal a touch of Hill Country terrain with dramatic elevation changes, as well as the typical Houston- area prairie lands. In 1951, Lakeside was born when a group of prominent Houston businessmen bought this area west of town known as Pine Lakes Farms. Ralph Plummer came in and designed the layout, which was modernized by Ron Pritchard in 1990. Named after a hero of the Sir Walter Scott poem "Marmion," the ultimate male chauvinist, Lochinvar is an exclusive, all-male golf club patterned after Dallas' Preston Trail. In the late 1970s Houston businessman Curtis Hankamer organized the property and hired Jack Nicklaus to come in and design one of his few Texas courses. 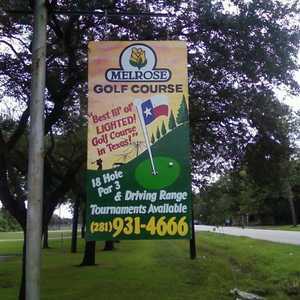 Melrose is one of eight muni tracks inside the Houston city limits, Melrose is a lighted par 3 course that is ideal for cold beers and late-night practice rounds. Getting there : From I-45 north drive past Little York and take the Canino Rd. exit. Drive east for 3 miles past Airline Dr.
One of Texas' classics, Memorial Park dates back to the 1920s when John Bredemus utilized work crews from the Civilian Conservation Corps to build what was one of the nation's best courses at the time. On the grounds of the old Ellington Air Force Base that shut down in the 1970s lies the 18-hole Pasadena Muni, upgraded by Jay Riviere in 1981 with an additional nine. River Oaks isn't the oldest, but it's definitely one of the preeminent names in Houston golf. Dating back to 1925 when Houston was hardly exposed to the game of golf, Philadelphian Jack Burke Sr. Formerly known as Channelview Golf Course, which was built by Howard Hughes in the late 1940s, Channelview found a new location and built a brand-new course. Known for its immaculate, champion Bermuda greens that lean toward the fast side, the design features seven water holes and is mostly flat. The Royal Oaks CC serves up an unparalleled Fred Couples signature course that tips out to a 7,007-yard, par 72, highlighted by the superb features of the country's finest golf clubs: tall Texas pines, scenic waterfalls, undulating, multi-level greens, and even a few island holes. Originally known as the Sharpstown Country Club back in the 1950s and '60s, and former host of the Houston Open, the course shut down amid financial turmoil until the city of Houston scooped it up in the late 1970s and hired Jay Riviere to renovate the layout. The 18-hole Sterling Country Club in Houston, TX is a public golf course that opened in 2011. Greens are Mini-Verde Bermuda and fairways are 419 bermuda grass. Originally opened as a 9-holer in 1924 for the Texas Co. , TCC is the oldest existing private course in Houston that is still in its current location. Another nine was added in 1938, creating the full golf experience with a design that incorporated the unusual Cypress Pond. Westwood Golf Club, founded in 1928 as Westwood Country Club, has the distinction of being the second oldest private golf club in Houston on its original site. Originally designed in 1928 by John Bredemus, in 2002 the members chose to reestablish Westwood as a premier private club with an emphasis on golf. Pine Forest was originally a John Bredemus-designed course located just north of Loop 610 in the middle of Houston Heights. When the club moved west in 1974 to avoid Houston's sprawl, they hired Jay Riviere to come in and build three 9-hole tracks. The original 18 opened in 1977 after Jay Riviere brought in over 2,000 trees to line the fairways, and a third nine was added in 1986 by Joe Finger. Each nine features some impressive, difficult par 3 holes and plenty of bunkers throughout the design.